Those who thought New England cuisine consisted of lobster rolls and baked beans will find Northern Hospitality: Cooking by the Book in New England as unexpected and refreshing as a warm breeze off the North Atlantic. Keith Stavely and Kathleen Fitzgerald, a husband-wife team of librarians turned independent scholars and writers, have crammed their second volume on New England cookery chock full of regional food history, cooking lore, and recipes. 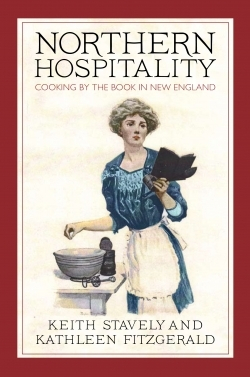 The authors devote the first section of Northern Hospitality to a social and culinary history of New England from colonial times to the early years of the twentieth century. Primarily through the principal cookbooks in use at various periods, Stavely and Fitzgerald pursue issues such as: is it compatible with Puritan standards to enjoy food for the sheer joy of eating? (Not an easily settled question.) “Clearly by the 1760s, with such distinct savoring at diverse points of the New England compass of Indian pudding, chowder, and johnnycake, Puritan temperance in diet, crossed with Yankee insistence on the value of local traditions, was modulating into a set of aesthetic and consumer preferences that amounted to a New England variation on the English theme of economy, neatness, and elegance blending harmoniously together.” The answer was uniquely a New England answer. New Englanders also questioned whether a proper lady should be educated in the domestic arts, including cooking, or whether these matters should be left to the hired staff. Stavely and Fitzgerald recount how Catharine Beecher, sister to Harriet Beecher, addressed this issue and many others in several books written in the mid-1800s. “In emphasizing that women able to employ servants ought nevertheless to be possessed of housewifely knowledge and skills, Beecher was reaffirming a distinctively New England set of values.” The history concludes with Fannie Farmer, whose writings became enormously popular at the turn of the twentieth century, and whose cookbook is still in print. Part Two of Northern Hospitality consists of traditional recipes and commentary from various periods. Naturally, the section begins with the contributions made by the Indians of that area. They include a recipe for Indian Pottage, a boiled combination of corn, kidney beans, and whatever else was available, such as fish, venison, nuts, and berries. The authors also present methods of cooking eel, such as baked eel and stewed eel. Although eating eel has gone out of fashion in New England, eel was recently the ingredient of choice on the Food Network show “Iron Chief” and is still eaten in other parts of the world. Northern Hospitality is a big book, containing nearly fifty pages of Notes at its conclusion. It is filled with information and recipes that will enlighten and enthrall anyone interested in food, cooking, or social history.